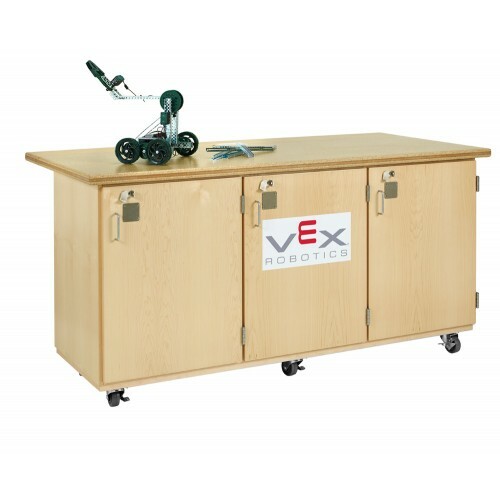 Diversifieds' VEX Robotics Workbench allows up to three teams to work on and store their robots and supplies. This spacious workbench features three locking storage compartments, each with a roll-out shelf that holds up to an 18" robot, a drawer and a customizable foam insert to protect tools and equipment. Each compartment is outfitted to accept a combination lock. The top is constructed of a medium-density fiberboard between two layers of 1/2" high-density particleboard, creating a non-conductive and splinter-proof top that is 1 1/2” thick. The top can be extended an extra 8" for additional workspace. Lowering the extension allows the unit to fit through standard doorways. The workbench moves easily on 4" heavy-duty, locking casters.